So I have been on and off track the past month and can’t seem to keep it on the straight and narrow. (sighs) Well in the midst of my inconsistent behavior, I’ve been using the same ideas in the morning to try and get in high calories. My weakness is the evening time when I hardly have any energy left to cook, so the morning time is extremely important to me. 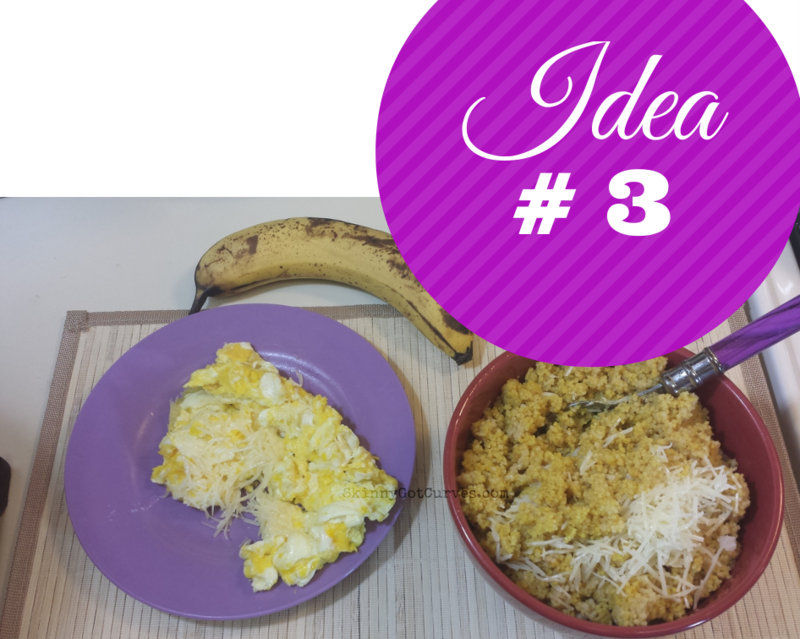 To see the tutorial for all of the breakfast ideas, please visit my Youtube video here and subscribe. I usually eat these meals throughout the morning and never in one sitting. Maybe one day I’ll get to that point where I can stuff my face like this in one sitting. The best way to eat all of this is start early with the main dish and take the remaining portion to work or school to finish. 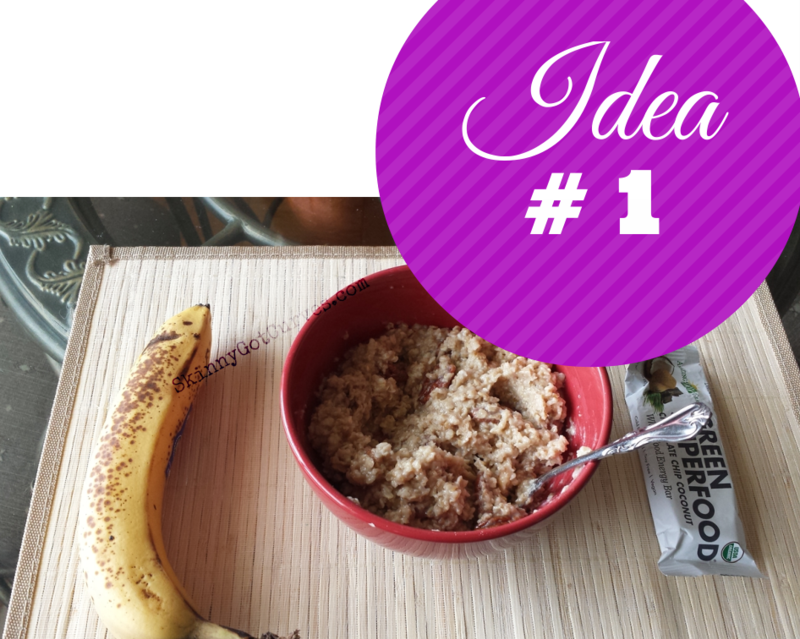 Eat the add ons (banana or energy bar) while commuting to your destination. That’s how I usually get these calories in with no problem. Directions: Follow directions of Instant Oatmeal. Add raw pecans to oatmeal and mix together. Add banana and energy bar to the side. Directions: Scramble Eggs in desired manner with cheese. Preheat oven 410 Degrees. Place Naan bread on cookie sheet or use aluminum foil. Place in center of bottom rack. Heat on both sides for 2 minutes. Cut avocado open and scoop out meat. Cut into slices. 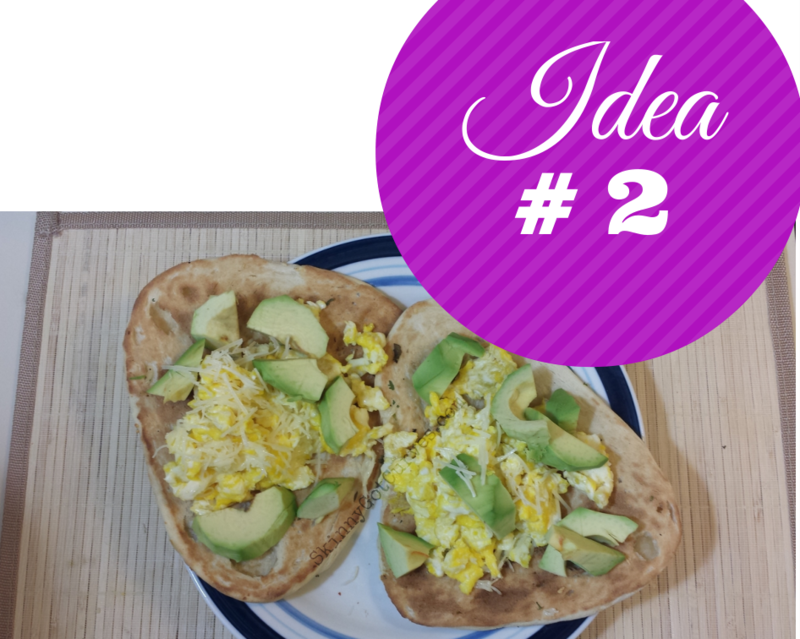 Add eggs on top of bread and avocado slices on top of eggs. Fold sandwich in half or roll up like a burrito to eat. Directions: Bring vegetable broth to a boil and then turn off heat. Pour couscous in the pot and cover for 5 minutes. After 5 minutes, remove cover and fluff with a fork. Add spices and/or seasoning for flavor. Add coconut oil to couscous and mix well. Cook eggs to desired manner and add cheese. Directions: Melt Coconut Oil for mixing. Add all ingredients to blender. Blend well. Voila! You have your smoothie. Directions: Bring water to boil. 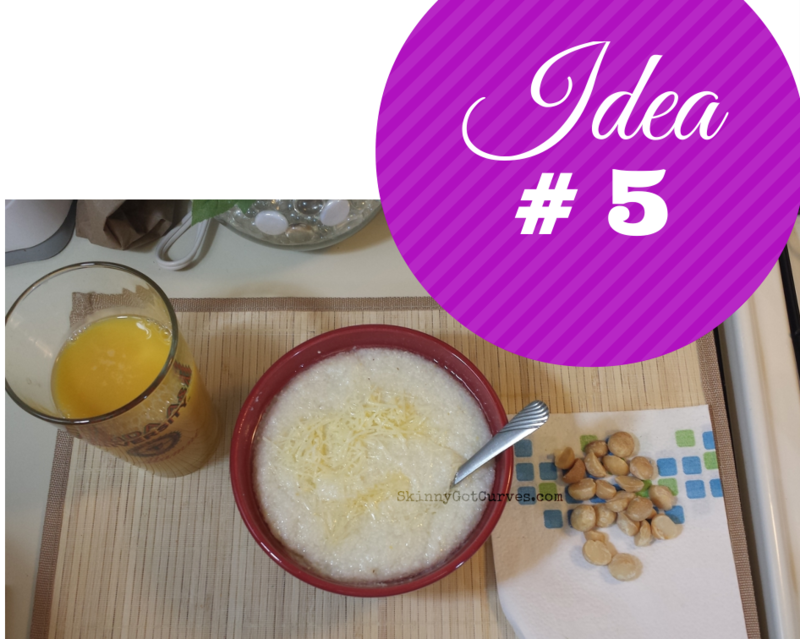 Add grits to water and bring to a boil. Turn down to medium heat. Allow grits to simmer and cover. Simmer for 5 – 7 minutes. Pour grits into bowl and add coconut oil. Sprinkle Parmesan cheese on top. Hope these ideas were helpful. You can modify the serving size to your liking. These are just some healthy ideas I enjoy using and I’m sure someone else can use too. 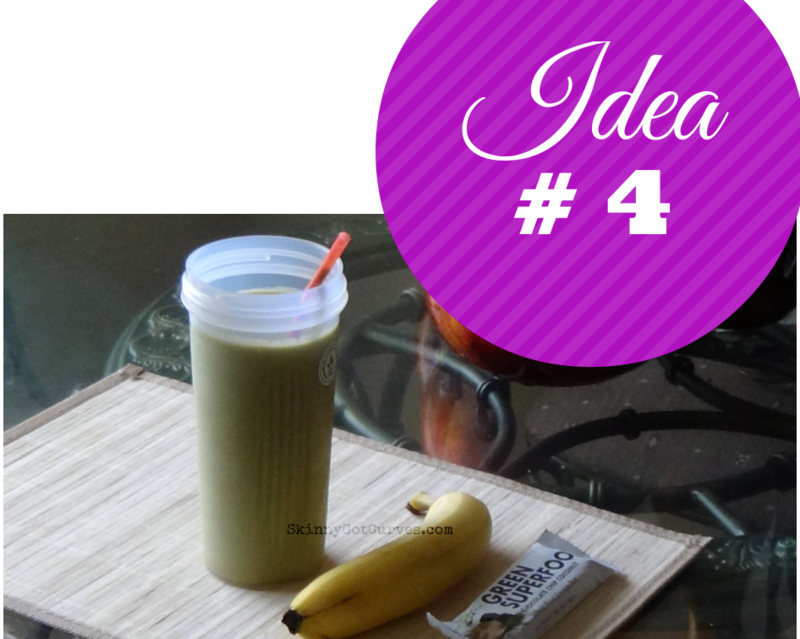 Stay tuned for review on Weight Gain Smoothie Book… maybe some fav tutorials as well. Need more weight gain snack ideas?? Check out my weight gain favorites on Amazon.